It's March 17th, it's Waltzingmouse Stamps Blog Party time!! In case you didn't know it's St.Patrick's Day today!! We've a long weekend here in Ireland because St.Patrick's Day is on a Saturday this year, so we have Monday off!! Ok, the official theme is St.Patrick's Day/Irish/Green! If you're not into St.Patrick's Day it's perfectly ok just to make something green. You can check the posting times for your direct links in this blog post. Just add the link to your project using the Inlinkz tool that will be available to you on the Waltzingmouse Makes Blog (Claire's blog!). Ok, on to my card! I just looked at a few photos of sheep in the landscape and penciled them in first, making them the right size was the hardest bit! Once they looked ok I outlined them using some brown watercolor paint and a fine brush. They're just little blobs with heads really! I colored the whole little Irish scene using watercolor paints, the pan palette type. I love the effects you can get with watercolors, especially the wet-in-wet technique. I stamped the scene using Coffee archival ink instead of black for a softer look. I really wanted to keep the scene the focal point of the card so I kept the rest of the card pretty simple. I rounded the corners of the painted scene and green card (just by drawing around a button, seriously I don't have a corner rounder!) The background I embossed using a herringbone embossing folder. 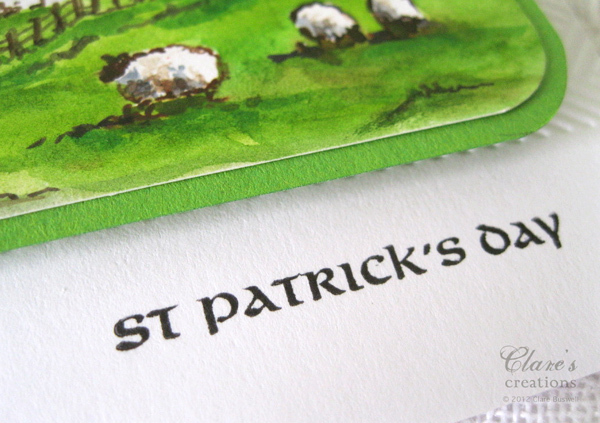 The sentiment is from the Celtic Heritage Stamp Set from Waltzingmouse Stamps. The inside of the card I stamped using one of the sayings from the Irish Blessings Stamp set from Waltzingmouse Stamps, I love those little shamrock stamps! That's it, I hope you're enjoying the blog party and have a chance to make something! We're heading to my hometown today to see the parade, we never miss it, hopefully it won't be too chilly, we'll go prepared though, wrapped in layers of... green!! 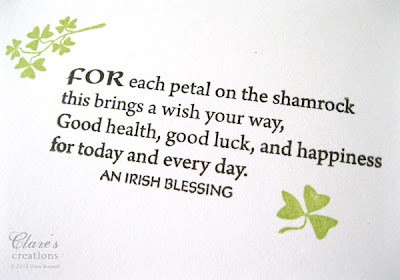 : ) Happy St.Patrick's Day wherever you are in the world! Thanks for dropping by. and those sheep are perfect!! Just gorgeous Clare! 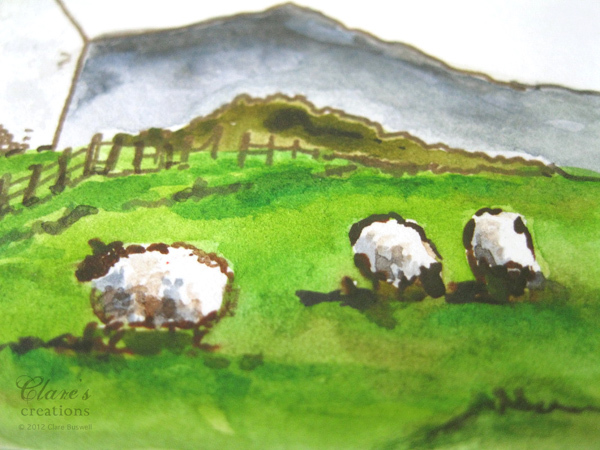 Love your little sheep, a marvellous addition to this rural scene! Happy Partying! Oh Clare - how pretty - this is just how I imagine Ireland to be - lots of beautiful green country side! Your coloring is beautiful and I love the sentiment! Happy St. Patrick's Day! This is beautiful Clare! A wonderful scene and a wonderful card. Is it just me who can't link my card yet? P.S. Happy St Patricks Day!! Gorgeous, Clare. Your comment about the sheep is so true. Your little "blobs" with heads are so realistic. This reminds me of a small print that I purchased in Ireland and that I keep on my desk. Happy St. Patrick's Day! 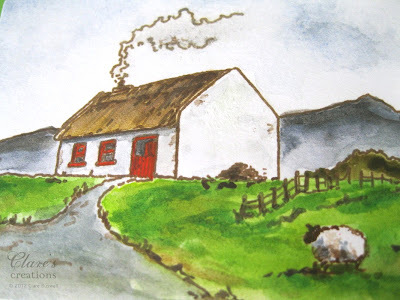 What a lovely little water color painting you created Clare!! I LOVE your sweet little hand drawn sheep - maybe be can get our Claire to make some additional little sheep stamps!!!LOL!!! Wow, look at you and your mad sheep creating skills. Love what you have done with this set. A lovely Irish countryside...makes me want to catch a plane to come visit. Happy St. Patrick's Day. Thank you for taking us to Ireland on St. Patricks Day! Beautiful card and scene. Gorgeous coloriing! Cute sheep too! Wow, love the watercolour!beautiful card. this is jaw dropping amazing. the details, the painging, everything really. Okay I started to comment awhile ago, and don't remember finishing...did my daughter Claire (6) finish for me? Or did she just turn off the computer, ha! This is so awesome, Clare! I just love the sheep, cannot even believe that you drew them...second thought, yes I can :) They are the farthest thing from a "blob with a head" that I have ever seen, heeee! This looks like a beautiful folk art painting, LOVE! Wow...this card is amazing and I love that you added the sheep. 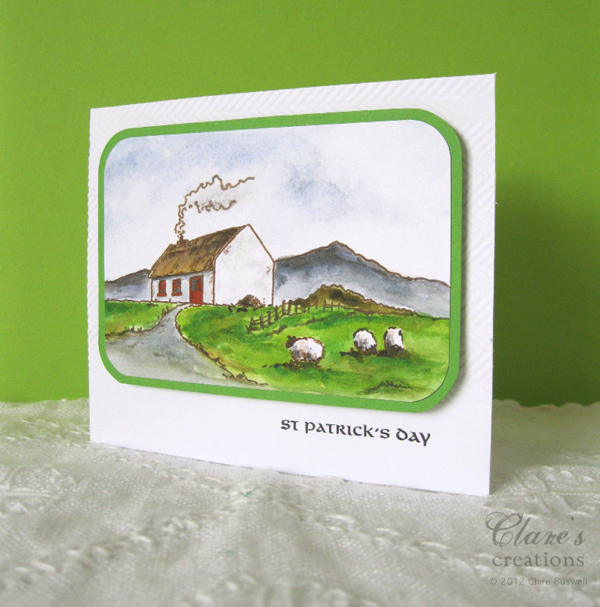 Happy St Patrick's Day, Clare! Your card is SO gorgeous!! Love the beautiful scene and your colouring is amazing!! What a gorgeous little work of art! Best St.Patricks day card I have seen. Love it! Wonderful card Clare! Such a pretty countryside scene! Happy St. Patrick's Day! I'm just in awe of what you did with this stamp - and how you 'just' added some extra sheep! What a wonderful scene you created - it looks like it should be framed! What an absolutely unique and very beautiful card! Way to let the image carry the card, though your added touches really push it over the top. stunning, your watercolor is amazing! Oh Clare, you truly got the full essence of the "Old Country" just as I remember it. I hope and pray my Daddy can see it from above! I'm bound and determined I'll get back there one day very soon to see its beauty one more time. I love the sheep and the cottage and the countryside so very very much. Saying Thank You doesn't seem enough.thank You my new Friend with all my Irish Heart and many many Blessings to you amid yours. Oh, how I love this! I had the pleasure of visiting Ireland a couple of years ago, and this brings back so many happy memories! Great minds! I love this image and sentiment - your card is so beautifully coloured! I do hope that you had a simply fabulous St Patrick's Day! Gorgeous! I have this stamp set (and love it) but never in my wilest dreams would I have thought of doing what you did with it. And even if I had there's no way it would have turned out so beautifully. You're very talented. Lovely, lovely card. SQUEALLLL!!!! I love those wee sheep!!!! genius!!! Hugs to you missy! Oh this makes me smile :) Your little details have created such a beautiful scene, and your coloring is top notch! I love this, Clare! It's wonderful. It reminds me of the Mother Goose book of nursery rhymes landscapes. Sorry this is so late, trying to get caught up! 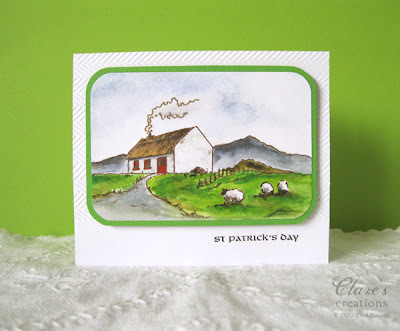 What a wonderful card, it makes me feel like I am in Ireland!